Ken Einiger was born in Brooklyn, New York, in 1960. At the age of ten, Ken and his family moved to Fort Lauderdale, Florida, where he lived for the next 33 years. During that time, he owned and operated numerous companies, began playing blackjack, including tournaments, and met the girl of his dreams. In 2003, Ken, his wife Kimberly, and two Golden Retrievers (Nikki & Ali) moved to Las Vegas. Living in Las Vegas enabled him to fulfill some dreams, among them pursuing a gambling career. 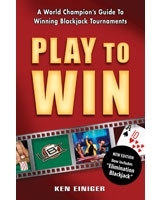 Since winning the World Series of Blackjack, Ken has kept busy giving private blackjack lessons and conducting blackjack seminars around the country.